Airport West Station will be located to the west of the current domestic terminal and is planned to be underground. A 150m island platform at a lowered track-level, similar to that at the Perth Esplanade Station, is planned at the three new stations. Passengers travelling by the Forrestfield-Airport Link stations will have to pass through SmartRider, a fare-controlled gate to reach the platform from the concourse. The location planned for the Forrestfield station lies to the east of the Forrestfield freight rail marshalling yard. The majority of the Forrestfield-Airport Link will run through underground bored tunnels. The Forrestfield station is estimated to serve 9,800 trips a day by 2021. The Forrestfield-Airport Link is an 8.5km rail line running between Perth Airport and Forrestfield, Western Australia (WA). The $2bn state government-owned project is to begin construction in 2016 and be completed in 2020. A decision on the procurement for the project is expected in late 2014. The landmark transportation project is expected to expand public transportation options for the foothills area, as well as improve transportation options to and from the airport across the rail network. It will connect an increased number of TransWA services to Perth Airport and provide access from more than 200 regional towns. The majority of the Forrestfield-Airport Link will be underground, with approximately 8km of the line passing through two new tunnels. This underground route was selected as the best solution to reduce the impact of construction at the ground level, as well as to avoid interference with the existing aviation infrastructure. "The landmark transportation project is expected to expand public transportation options for the foothills area." Three new stations will be built as part of the project. Twin tunnels will be built beneath the Swan River and Perth Airport running through Tonkin Highway and Brearley Avenue. The line will run underground to finally surface in Dundas Road, before ending at the new above ground station to be built in Forrestfield. 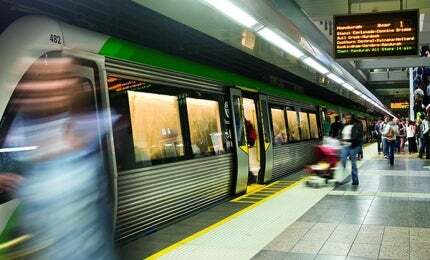 The new line will meet the Midland train line near Bayswater train station, providing additional capacity. It is expected to cut the journey time from Forrestfield to Perth central business district (CBD) from 45min by car to 20min by rail during peak times. It will also speed up the journey from Kalamunda to the CBD with improved feeder bus services at the Forrestfield Station. The present 70min time required during peak hours will be cut down by half. The project definition plan (PDP) was released in August 2014. The environmental studies and the geotechnical investigations are ongoing. The release of detailed design and award of contracts are scheduled for mid-2016. The first train service on the line is planned to begin in 2020. The twin tunnels will have internal diameter of 6.2m and will be bored using tunnel boring machines (TBMs). The average depth of the underground tunnels will be 15m. Airport West Station will be located to the west of the domestic terminal and is planned to be underground. The station is estimated to serve an expected population catchment area of 20,000. Drop off bays, park-and-ride bays with capacity between 500 and 1,000, infrastructure for pedestrian and cycle riders, six active bus bays and three bus layover bays have been planned for the comfort of the passengers. The station is expected to serve 4,000 trips a day by 2021. Passengers will have to pass through SmartRider, a fare-controlled gate, to reach the platform from the concourse. Two escalators and two lifts providing universal access will be built at the station. The station platform will feature information displays and systems, lighting, CCTV, public address systems and seating. The underground Consolidated Airport Station will be located adjacent to the international terminal and to the south of the air traffic control tower. The location will provide easy access to each of the planned domestic and international terminals. The station will feature lifts, stairs and escalators to link up with the connections to the terminals. Fare gates and other facilities will be similar to those planned at the Airport West Station foyer. The location planned for Forrestfield Station lies at the east of the Forrestfield freight rail marshalling yard, near the intersection with Maida Vale Road. More than 90% of the passengers are estimated to reach Forrestfield station either by car or bus, making it a major traffic interchange point. In order to provide easy access, the station will include eight active bus bays, four layover bus bays, parking for 2,000 to 2,500 cars, drop-off bays and easy drop-off facilities for pedestrian and bicycle traffic. The station entrance will be located on the eastern side of the rail line. Forrestfield Station will serve as a growing residential catchment of approximately 60,000, which includes the suburbs of High Wycombe and Forrestfield, Maida Vale, Gooseberry Hill and extending into Kalamunda. By 2021, the station is estimated to serve 9,800 trips a day, with a possible southward connection in the future. The project will be referred to the federal environmental department and the state Environmental Protection Authority, under both federal (Environment Protection and Biodiversity Conservation Act 1999) and state (Environmental Protection Act 1986) environmental legislation. It will also seek approval under the Aboriginal Heritage Act 1972 for the use of land containing registered Aboriginal heritage sites. The project concept design has excluded areas of environmental and heritage values. The construction of the tunnels will not have adverse impact on the Swan River as any disturbance to the river bed or alteration of flows will be avoided.